WATERLOO, IOWA (January 26, 2017) — Build Our Ballpark and the Optimist Club of Waterloo recently teamed up to create a tribute to 70 years of Waterloo boys’ and girls’ baseball and softball. Build Our Ballpark designed the interior display of a cabinet built by members of the Optimist Club, which can now be seen in the lobby of the Cedar Valley SportsPlex in Waterloo. Bob Hellman, founder of Build Our Ballpark and member of the first Optimist Club boys’ baseball team in 1947, was more than happy to help out. Tony Luetkehans and Ed Flack designed the interior of the cabinet. 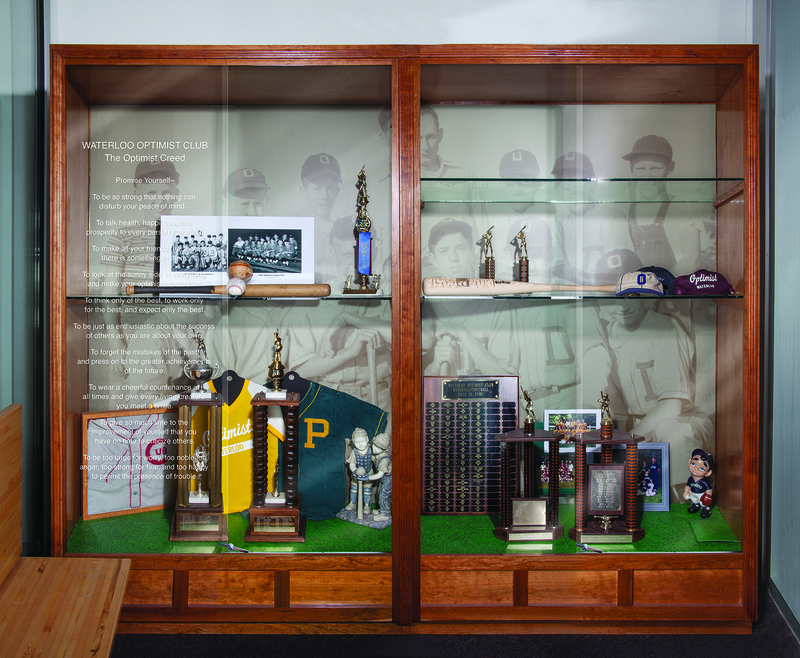 The cabinet houses trophies, jerseys, hats, photos of teams, and more from the last 70 years of baseball and softball here in Waterloo, all given to the display by past team members and coaches. A large backdrop shows the first boys’ baseball team, and the glass front is emblazoned with the Optimist Creed. 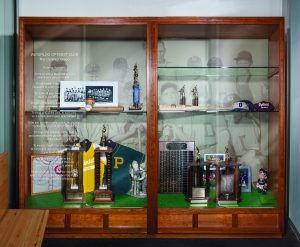 More memorabilia will be added to the cabinet over time, as more boys and girls continue to enjoy and succeed in baseball and softball in the coming years.